Product Details - Material- Non-toxic rubber and Rope, Use -The toy is gentle on the teeth and is a great chew toy. It gently massages the gums and takes care of the dental health, Dimensions 20 cm, Suitable- All Breeds Dogs. 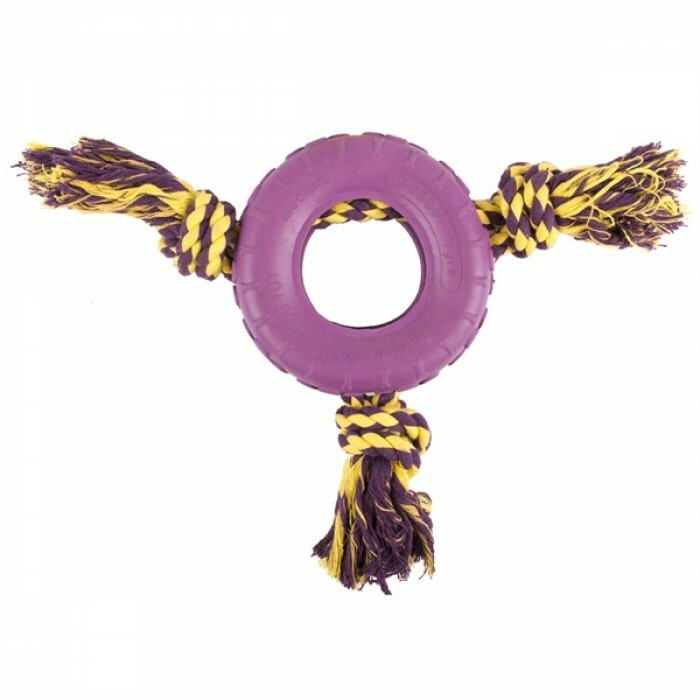 Product Information - Rubber Tyre - Three Way Rope One of the best ways to keep pets engaged is to provide them with toys that will keep them mentally and physically engaged. Pet Brand Rubber tyre and Three Way Rope toy has been specially designed to provides of playing and chewing fun to your pets. In the center there is a rubber tyre that is made with durable rubber which is resistent to the most persistent of chewers. The binding rope is made with premium quality 100% cotton rope. The toy is gentle on the teeth and is a great chew toy. It gently massages the gums and takes care of the dental health. The toy can be used as a training toy too. Ideal to play fetch and chase; Made with durable material, Resistent to the persistent of the chewers, Toy can be used as a training toy.